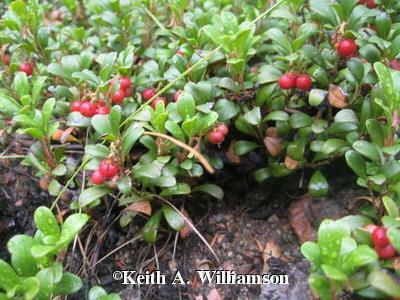 Kinnikinnick is February 2019 Plant of the Month – Glacier View Landscape and Design, Inc.
Kinnikinnick of various forms also known as bearberry because sometimes bears will eat the Fall berries in mountainous native growths, or by its botanical name Arctostaphylos uva-ursi is a low growing, mostly evergreen ground cover that is an excellent shade tolerant choice for slope erosion control. It is hardy in zones 2-6 and prefers a dry, cool, part sun to shade exposure. It will tolerate moderate to full sun if established and kept sufficiently moist. It is, however, xeric and will also tolerate some drought if shaded. This makes it an ideal candidate for shade or part sun around Lafayette Colorado landscapes. Kinnikinnick is readily available in local nurseries and is easily planted in a #1 size container. Moderate soil amendments for the Lafayette, Colorado clay soils is appropriate, and good early watering is important for establishing root growth. It should not be overwatered and it may like a sandy or rocky soil as well. It does not like to have its feet wet continuously as it will be susceptible to root rot and black mildew. Kinnikinnick is native around the globe in the northern hemisphere north of Zone 7 in woodsy settings. It can be found in the foothills of Colorado in abundance, but is difficult to transplant from the wild. 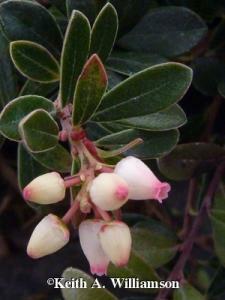 Miniature drooping bell shaped flowers emerge white to pink in mid-spring with rounded berries appearing in late summer. The berries are technically edible, but tasteless. Birds and small mammals love them. Fall colors are tinged with red and gold for a striking contrast. Plant a few along the top of a wall and watch them cascade over the top. Use them in rock gardens and around other shrub plantings for a carpet like appearance. However, be patient, as they are rather slow growing, but long lasting. Contact Dave to learn about a free consultation and estimate for your local Lafayette (Boulder), Colorado area landscape project. Follow us on Pinterest or Facebook to see our featured landscaping project photos.